The possibility of longer, sounder sleep. While a newborn sleeps around 16 hours per day, that sleep is in 3- to 4-hour intervals. It’s been said that swaddling appears to increase the amount of REM (rapid eye movement) sleep that newborns get. This deeper sleep state may make it less likely for a baby to fully awaken when roused – which for parents means fewer trips to baby’s bedside. Swaddling may soothe a crying baby. This is the benefit that compels so many parents to try swaddling. Imagine: Getting your newborn to stop crying in a few simple folds! It’s not magic, though. Research has shown that swaddling can decrease crying by 42% in infants 8 weeks old or younger. 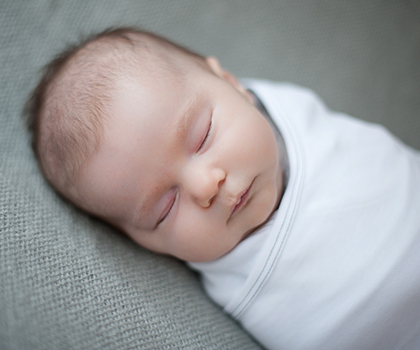 Swaddling may reduce the risk of sudden infant death syndrome (SIDS). Babies who sleep on their stomachs are at higher risk of SIDS. For that reason, babies should sleep on their backs. A properly swaddled newborn, with their face up, will be less likely to fidget and shift in sleep and end up on their tummy. We were advocates of swaddling with our first son and we certainly can attest to the benefits so with the arrival of our second we hoped our newest addition would adopt the same behavior. I was fortunate enough this time around to be introduced to the Nested Bean – Zen Swaddle. Designed to mimic a parents touch, the Zen swaddle is unlike other products as it has lightly weighted areas that gently apply pressure to your infant’s sides and centre to mimic the comfort and security that they feel when they are being held. Touch or simulated touch is medically proven to calm babies by triggering a self-soothing response thus improving an infants’ ability to regulate stress. 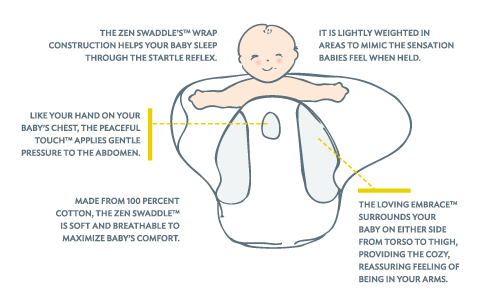 The Zen Swaddle was developed to combine the benefits of swaddling and touch to provide a safe, secure environment for your baby. Upon receiving the wrap the very first thing I noticed was the light weight material and the cute little weighted chick on the centre. It’s important to ensure that your infant doesn’t get too hot while they are sleeping so it was wonderful to see that Nested Bean took careful consideration when picking their 100% cotton textiles. 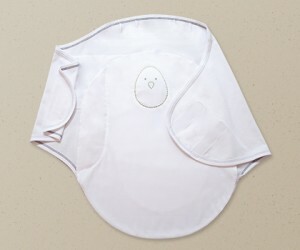 New parents will love that the Zen Swaddle comes with instructions that include great pictures that are clear and very easy to follow making swaddling your baby very easy. With both of our boys we found that they didn’t particularly like the motion of getting swaddled, which as new parents initially made us believe they didn’t like the swaddle – however with both of them, once they were wrapped they quickly calmed down and we certainly found that swaddling helped us. The Zen Swaddle is designed with a built-in pouch for babies smaller than 23” and younger than one month. You simply place your baby’s legs into the interior pouch to create a snug fit for the Zen Swaddle when he or she is younger. It helps foster the cocoon-like feel of the product and aids your baby in sleeping through the startle reflex. As your baby gets older, you can choose to forgo the interior pouch so he or she can have more legroom. It’s been designed so that baby’s arms can either be inside or outside the swaddle – we personally found that inside worked better for us. Having his arms outside meant that if he had an jarring movements with his arms it would still startle him a little – but it really is a personal preference. Created with velcro sides that ensure it stays safely snug on your baby, the Zen swaddle applies gentle pressure on the sides and on their chest to feel like your wee one is being held. We all know babies can be messy – accidents and spit-up’s do happen so it’s important (for me anyway) that the baby gear I use can easily be cleaned. I was a little concerned that the swaddle may not wash well because of the weighted section but I was pleasantly surprised that it can be washed frequently. The garment’s construction ensures filling stays in place through repeated washings. To protect the quality of fabric, they do recommend washing in cold water, on a gentle cycle and drying using low heat. Nested Bean has reports from parents that their infants are sleeping up to two hours longer at a time, our experience would be similar for sure. Our son slept well and certainly for longer periods of time – which made me one happy mama. Designed for children 0-4 months of age (7-14lbs), I certainly found the Zen Swaddle by Nested Bean to be different than other swaddles on the market. When put to the test their design stood up to their claims for safety, comfort and longer sleeps. Available in four designs and retailing for $39.99 makes it a little more expensive than other swaddles I’ve used – but I can attest that it’s also worked better making it worth the extra money. Whether for yourself or as a gift I’d recommend the Zen Swaddle.